I got a bunch of new books tonight in the mail tonight, mostly commentaries and other books I’ll be using for my ministry here. 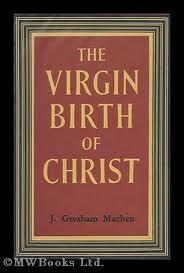 One that I threw in out of interest was Gresham Machen’s The Virgin Birth of Christ, which I’ve been spending the evening reading. I can already begin to see why its a classic. Machen is such a greater writer – constantly quotable. In the book he shows how organically connected the doctrine of the virgin birth is to the whole Christian gospel, and how important it is as an expression of its supernatural character. Though the bulk of the book is devoted to a defense of this doctrine, he does address its significance for the Christian in the conclusion, showing that it highlights the supernatural character of the gospel, reveals one’s view toward the authority of Scripture, clarifies the nature of the incarnation, and points to Jesus’ sinless exclusion from Adam’s corporate guilt. Interestingly, in this section he makes a similar kind of argument about the virgin birth that N.T. Wright has made more recently about the resurrection, namely, that its truth is the best explanation for the way and the time in which it came to believed by so many. “Our knowledge of the virgin birth, therefore, is important because it fixes for us the time of the incarnation. And what comfort that gives to our souls! Marcion, the second-century dualist, was very severe upon those who thought that the Son of God was born as a man; he poured out the vials of his scorn upon those who brought Christ into connection with the birth-pangs and the nine months’ time. But we, unlike Marcion and his modern disciples, glory just in the story of those things. The eternal Son of God, He through whom the universe was made, did not despise the virgin’s womb! What a wonder is there! It is not strange that it has always given offence to the natural man. But in that wonder we find God’s redeeming love, and in that babe who lay in Mary’s womb we find our Saviour who thus became man to die for our sins, and bring us into peace with God” (394). Always enjoy your posts. Just curious, what other book on the virgin birth (or the incarnation in general) have you found helpful or would recommend? Thanks! Hey Matt, I haven’t read much in that area, but remember Don Macleod’s book The Person of Christ from Christ and Salvation with Peterson? I seem to remember the first chapter of that book was on the virgin birth, and was super helpful. On the incarnation, I always think of CS Lewis’ writings. Nothing comes to mind as a theological book devoted to it. Hope you are doing well!